MariaDB is one of the most popular relational database servers made by the original developer of the MySQL Database server. MariaDB is a fork of MySQL that supports the XtraDB storage engine, InnoDB storage engine and a new storage engine called aria. MariaDB Galera Cluster is a synchronous multi-master cluster for MariaDB that is available only on GNU/Linux-based operating systems. Galera Cluster supports only the XtraDB and InnoDB storage engines. It uses the Galera library for replication with automatic member control, automatic node joining and for reading and writing to the cluster nodes. Root privileges on all four servers. In this step, we will install and configure the MariaDB Galera Cluster on 3 CentOS servers. We will install MariaDB-Galera server, then enable the firewall and open some ports for the database and other services. Then we will install the clustercheck script on each MariaDB server, so we can check the server status from the HAProxy. sed (stream editor): replace "SELINUX=permissive" with "SELINUX=disabled" on /etc/sysconfig/selinux file. In this step, we will install MariaDB Galera 10.0 which is available in the MariaDB repository. We will turn on the default firewall of CentOS 7 called Firewalld. We will turn it on and open the TCP ports that are used by the services that we will install. 3306 = Used for MySQL/MariaDB client connections. 4567 = Galera Cluster replication traffic. 4444 = For all other State Snapshot Transfer (SST). 9200 = xinetd - clustercheck. Bootstrapping the cluster.. Starting MySQL.. SUCCESS! Clustercheck is a useful bash script to make a proxy (ex: HAProxy) capable of monitoring the MariaDB server. Go to the line 10101, comment the services that use port 9200 and add a new line for mysqlchk/clustercheck. To perform the clustercheck, you must create a new user in MySQL. Login to the MariaDB shell and create a new user with the name "clustercheckuser" and password "clustercheckpassword!". 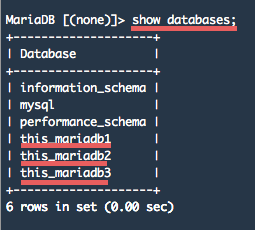 At this stage, all MariaDB serves are synchronized. Make sure the results code is 200. Next, create a new HAProxy configuration file. Go to the /etc/haproxy directory and backup the dafult haproxy configuration file. ## MariaDB balance leastconn - the cluster listening on port 3030. ## HAProxy stats web gui running on port 9000 - username and password: howtoforge. Port 3030 is the load balanced MariaDB port, we can access the databases on all MariaDB servers with load balancer IP and that port. Port 9000 is the port for the web-gui, it allows monitoring of HAProxy from the browser. Login to the MariaDB server, access the MySQL shell and create a new database from mariadb1, then from mariadb2, and finally from mariadb3. Now we access the MariaDB server cluster and databases trough the HAProxy IP on port 3030. Before doing this test, enable remote access to the MariaDB server by creating a new user root with host "%". mysql -u root -p -h 192.168.1.135 -P 3030 -e "select Host, User, Password from mysql.user"
You can see the users of the database server by accessing the load balancer IP on port 3030. You can access the databases on the MySQL nodes by accessing the HAProxy IP on port 3030. HAProxy has been installed successfully and you can see the MariaDB servers are monitored. MariaDB Galera Cluster is a synchronous multi-master cluster which provides load balancing for MySQL databases. This is a good solution to build a powerful database system for your site. MariaDB Galera Cluster supports the xtradb and innodb storage engines, it provides automatic replication and allows automatic joining of new nodes. We can use HAProxy in front of the database cluster as a load balancer. The load balancer helps to distribute incoming requests to all databases. We use the bash script clustercheck to perform database monitoring from HAProxy. MariaDB Galera Cluster and HAProxy is one of the best solutions to build a high availability database system. Dec 18 22:56:17 localhost haproxy: Server mariadb_cluster/monyet_galera1 is DOWN, reason: Layer4 connection problem, info: "Connection refused", check duration: 0ms. 1 active and 1 backup servers left. 0 sessions active, 0 requeued, 0 remaining in queue. Dec 18 22:56:17 localhost haproxy: Server mariadb_cluster/monyet_galera2 is DOWN, reason: Layer4 connection problem, info: "Connection refused", check duration: 0ms. 0 active and 1 backup servers left. Running on backup. 0 sessions active, 0 requeued, 0 remaining in queue. Dec 18 22:56:18 localhost haproxy: Backup Server mariadb_cluster/monyet_galera3 is DOWN, reason: Layer4 connection problem, info: "Connection refused", check duration: 0ms. 0 active and 0 backup servers left. 0 sessions active, 0 requeued, 0 remaining in queue. It would be useful to set two HAProxy servers for failover. I had the same issue, it was username and password miss match, between database user we created for clustercheck and user in the script(/usr/bin/clustercheck). ERROR 2003 (HY000): Cant connect to MySQL server on 'loadbalancerip address' (111 "connection refused). I am using centos 7 on all nodes.